The Celtic youngster has been called up into the Scotland squad for Nations Cup and there is another new face in Russell Martin of Norwich City. Celtic youngster James Forrest has been called up to the Scotland squad for Nations Cup and there is another new face in Russell Martin of Norwich City. The Celtic starlet and Norwich defender are the two news faces in Craig Levein’s Scotland squad for the double-header against Wales and Republic of Ireland at the end of the month. Forrest has been invited to join the squad on the back of an impressive breakthrough season in Neil Lennon’s Celtic team and could now earn a first cap in one of the matches in Dublin next week. Levein has announced a 24-man squad for the games against Wales on May 26 and what could be a title decider against Republic of Ireland on May 30. Forrest has made 23 appearances for Celtic this season, scoring three times. 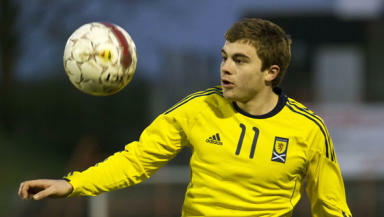 The 19-year old has already been capped for Scotland at Under-19 and Under-21 level. Right-back Martin was born in Brighton and played at Wycombe and Peterborough before moving to Norwich City in 2009. He has been an integral part of Paul Lambert’s side that clinched promotion to the Premier League this season and made 49 appearances for the Canaries this term, scoring five times. Blackpool’s Matt Gilks and Leeds striker Ross McCormack have been recalled but Wolves forward Steven Fletcher’s international exile continues. **Defenders: **Phil Bardsley (Sunderland), Christophe Berra (Wolves), Gary Caldwell (Wigan), Stephen Crainey (Blackpool), Grant Hanley (Blackburn), Russell Martin (Norwich City), Steven Whittaker (Rangers), Danny Wilson (Liverpool).